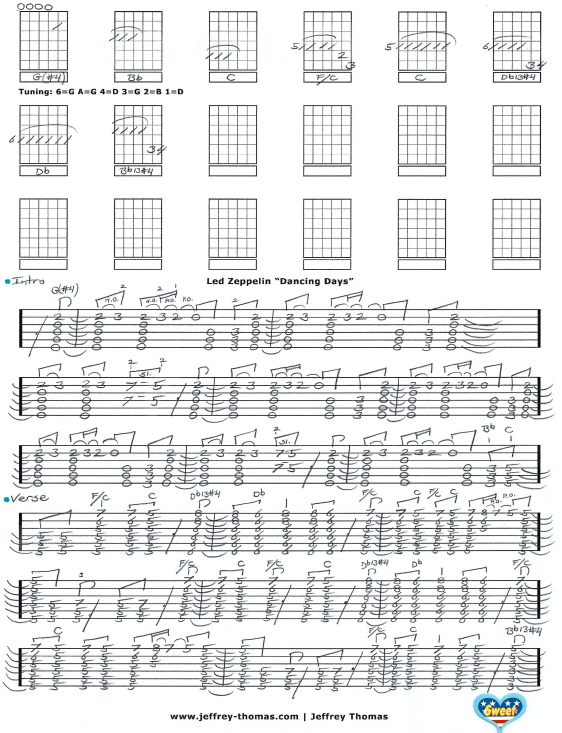 Led Zeppelin Dancing Days Free Guitar Tab by Jeffrey Thomas. This guitar tab shows the proper tuning, chords and as many signature licks as I could get. I think this arrangement works best on acoustic but it sounds great on electric as well. I stayed with rhythm playing so none of the lead melody parts made it to the tab. This arrangement is the one I will play live since it cover the rhythm and lead fills. Want the full guitar tab free? Just enter your email address on the form provided and I will send it to you. Looking to improve your guitar playing? Make sure to fill out the Schedule A Free Lesson form to set up your free Skype guitar lesson. “Dancing Days” is from Led Zeppelin’s 1973 album Houses Of The Holy. Find more great online guitar tabs on my tab, video and blog pages.